Printing Press Billing Software enables to keep track of raw materials, sales, customers and receivables. Improve your profit using Printing Billing Software. Printing press business is on boom now. A lot of people are preferring customized products like mobile cases, t-shirts, bottles, books, mugs etc. If you plan it properly, it will be a successful business for you. There few challenges facing by business are large inventory, difficult in forecasting business, understanding customer preferences, demand and supply, payment modes etc. Just Billing printing billing software helps you to overcome above-mentioned issues in a quick way. Our software records all the inventory and keep a track on it. Provides business analytical reports which show you the demand for products, customer buying trends and helps you to forecast the market. Just billing is the GST compliance software which can generate GST invoices and simplifies GST return filings. Just Billing will auto calculate tax during the billing process according to rules prescribed. The software also prepares the information to file the GST returns, you don’t need to hire anyone to do it. As the printing press business model is to take orders from customers, prepare and then deliver. So, advance payments happen very commonly. To every order, our software can record the advance payments and calculate the due amount which needs to pay later. It helps to collect the due amount without any confusion. Only one person may not available at billing all the time. So, just billing allows you to give access to the software for multiple people. But you can keep restrictions to each person according to your preference with different login details. For every product, we may create a standard price but it can vary according to design and difficulty in marking. Just billing gives you an option to keep different prices according to your choice depending upon customer requirements. You can configure the software according to your needs. For convenience, you can change the language. 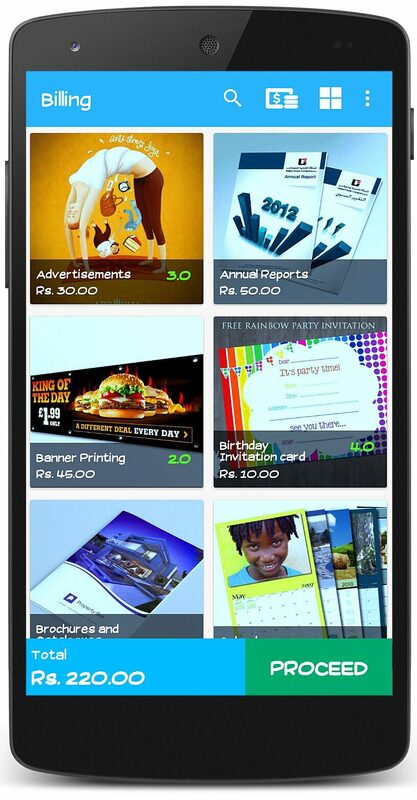 For promotions, you can configure SMS and Email. For quick billing, you can configure barcode scanning. For invoices, you can configure the printer and many more as per your requirements. A lot of raw materials and intermediate products are used to make the final product. So, we need to know how much material used to estimate the cost of the product to decide the selling price. Just billing records the details and calculates how many raw material products used and in what quantity. This can useful further whenever we produce the same product. Printing press business is mostly customization business according to customer requirement. In just billing, while you take the order, can note down what all customer needed and save it properly. When you having multiple outlets, warehouses, manufacturing units. All those can connect to the cloud head office and can operate from it. You can check all the branches performance, operations in real time easily by just login to the cloud. Download and follow simple steps to setup Just Billing printing press billing software.